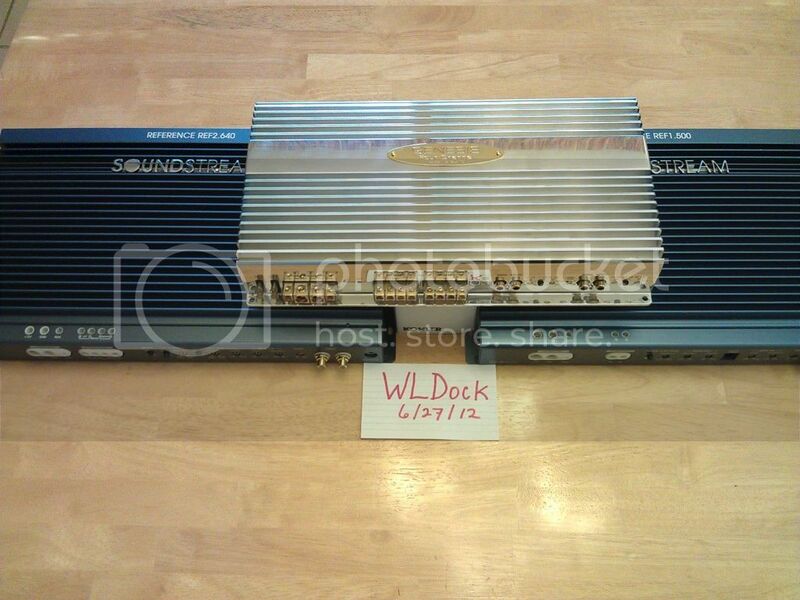 Looking for a 4 channel 50 to 100 watts amp? This is the car audio side Joe. We don't have better sounding amps around here. Haha! There are several great high quality amps out if you're wanting high quality. Zapco is always top of the heap. JL Audio is mainstream but their amps are still superb. Focal has some really nice amps out now that are built by Zed Audio and look really good. If I were buying new amps and were looking at the high end, those would be on the top of my list. Check them out on Crutchfield. Well you're right maybe missed placed a little.... What you stated is very sweet just not my price ratio.... Between Alpine and Blaupunkt what would you install under $250 or so. For that kind of money look for used over at www.DIYMA.com or for a good value on new...find a Soundstream REF4.760 REF4.920 on EBay, Amazon, google shopping, etc. Great quality and sound for $200-$300 net price. First off Joe, just as in home audio the source/headunit of a vehicle is the first line of good sound. amps unlike a DAC will only enhance what the HU is putting out. Alpine all the way. Their V Power amps are very good quality, make their rated power and at a good price. Not sure if they have speaker level inputs though. Check out JL Audio's entry level line. They're excellent as well and at a very reasonable price. Thanks for the info guys.... I let you all know how it went when I do it. Your Accord follows the current trend of OEM systems that are difficult to replace. Also, there are several High level to low level OEM interface units that do a lot more like sum, auto eq, crossover, source switching, level control, crossover, etc..units like JL Audio Cleansweep, JBL MS8, Alpine Imprint, Audio Control, etc...that are many more. Interesting but not sure how I feel about tearing my new car about for a radio. But adding an amp may by ok with me.... Saying that I know I'm limiting myself audio wise but... It's just a car to me. I plan on leaving the dash as it is. Can find them around the net for cheaper. Then..what are your goals? How many speakers in the car? You plan to replacement them? What about the low end? The plan is to replace Front and Rear speakers and add an amp. Tie'n to factory system, keep dash the same. And why is D is much cleaning? I own or still own some Nakamichi old school amps which were AB I sure and was clean noise, but today AB amps are 80db signal to noise ratio? Again hard to compare as testing methods are different but...both have great specs and more importantly both are great sounding amps. Specs are virtually meaningless. The JL Audio is the better built amp, will exceed it's rated power and have no noise. The benefit of the class D amp is that it's much more efficient and works in a much smaller chassis. That JL Audio HD amp can be mounted under the front seat it's so small. That's why class D is popular. Lots of power, very high efficiency and very small size. Not saying the Soundstream is a bad amp just that I'd rather have the JL for those same reasons. Yes, the JL Audio HD amps are the epitome of a high quality class D amp.Having good power might be more important to sound quality than the class D vs. Class A/B debate. In the car in makes SO much sense to seek efficient products if one is after big power. When I put together my next system I think I might use one of the HD amps myself... But they are not cheap! The XD line is more reasonably priced if one is looking for a better value. Anyway, my last system design consisted of a couple of those Soundstream amps for the low end and midbass, then I had an uber sound quality class A/B amp for the mids and tweets, a Genesis SIII 4 channel. Was going for an all out 4 channel system with dash pods, kick panel midbases, and an infinite baffle 15" sub. I never got the build done and may not get back to something like that for awhile. The next build will be stealth with one or two of the HD's tucked under something. Its just not possible to make a hand made in the USA amp today with the best components at a price that the masses are willing to pay. Nor does it makes sense as automated SMT can be very accurate if done with the right quality control. Nevertheless, the prices I've seen some of these amps go for on the net can be ridulously low. Gee, I wish to still have hearing after a trip ride.... Not sure I could with those amps. So what you're saying AB maybe better for mid and high sounds. Or is it the quality about the amp? D is just fine for mids and highs. There's no difference in the sound. The difference is in the efficiency and size. When class D first came around in car audio, they had a lot of audible distortion and weren't suitable for anything other than subs but nowadays they're as clean as any A/B amp with distortion well below the audible level. Of those two amps, I'd take the JL because it's slightly more powerful. If you're wanting something really small that you can hide under a seat or something, that Alpine would be perfectly fine. As far as class A/B vs. class D, class G/H, vs. tubes, etc some treat it almost as critical as 2 ch home audio. Some SQ purist only run expensive class A/B amps because think they sound better. That Genesis I had for example, the bias was custom adjusted to a more class A at the low level, class A/B as the output increases. I was after the best and cleanest output and a little warmth I could get for critical listening for SQ events and gatherings. Still some of today's class D like the JL's sound just as good in a quiet home environment. Get them out in the car rolling down the street they will more than meet the need. Hmm... no response bad choice given speaker back down on amp model? Or what? No problems with the amp and I've never run a LOC off my factory head unit so I can't tell ya anything there cause I always go with an aftermarket CD player even if it means losing stuff like display, steering wheel controls and what have you. As for the speakers, the DB's are decent but they're more what I'd consider entry level. The DXi's would be worth a look as they're a little better model. I'd personally drop the rear speakers completely and get a set of MM's for the front. One thing to check is the opening in the door for the speakers. Honda is notorious for making a small hole for their crappy stock speaker that nothing aftermarket can fit in. You might have to trim some metal down even with a spacer or go with a 5.25" speaker. I don't know about the '14 Accord but that's the way it's been with the 7th and 8th gen models. My car being last then 2 months old has over 5k of miles on it, due to work. It a LX model a little different in that the knob in the picture shown by the shifter is in the middle of the double din on mine. I don't have that second screen either, but the knob thing is the issue. Feel yes someone will work a kit out but for now no. Without know couldn't do anything like reset maintenance schedule. I'm open to other speakers with some mods I look into Thanks. That's why crutchfield recommended these 5 1/4 speakers the big issue in this car is the tweeter protruding height.